When I’m looking for a quick, nutritious, Whole30-type meal after a long day at work, I don’t have to look any further than a salmon filet. Prep and cook time, from refrigerator (or grocery bag) to being pulled from the oven is usually less than 20 minutes. The relish in this recipe will only add a few more minutes and will turn good fish into truly great fish! Prepare Pineapple-Mango Relish first as the salmon does not take long to cook. Grate the zest of the lime and combine with the lime juice. Stir in the salt and allow it to dissolve. Combine all other relish ingredients, pour the lime juice/zest over and toss to combine. Place the salmon skin-side down on a baking sheet. Brush generously with melted coconut oil. Press shredded coconut onto the all exposed areas of the salmon filet. Be generous with the coconut! Sprinkle the fish and coconut with powdered ginger, salt, and freshly ground pepper. Bake in oven for 8 -15 minutes (depending on thickness of the filet. ) Watch carefully to see that the salmon does not overcook. ( Not sure how to tell if the fish is cooked? Fine Cooking has a good guide here.) The coconut should brown a little. Lift the filet from the pan with a spatula. (A thin spatula can easily be slipped between the skin and the flesh, leaving the skin behind on the baking sheet.) Cut the fish into serving pieces and place on plates. 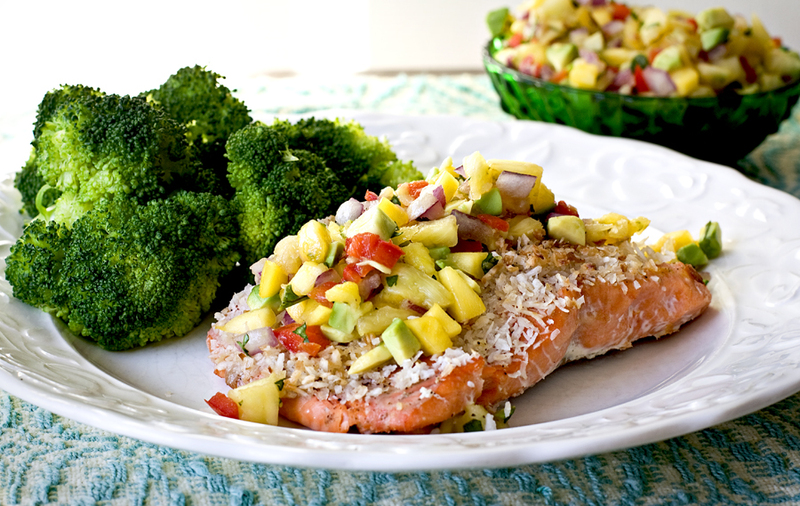 Sprinkle with Pineapple-Mango Relish and serve additional relish on the side. UPDATE: I put a couple of spoonfuls of the leftover Pineapple-Mango Relish on my scrambled eggs this morning. Delicious! Don’t forget to like The Health Wish on Facebook! That looks amazingly delicious! I am hoping to start the Whole30 on February 1st! Nervous, and excited! You can do this, Razella! It may be difficult at time because your body will crave the things it is used to, but if you stick with it for 30 days you will see food in a whole new light and you will feel empowered. Commit to doing it no matter what. I am! I am downloading the E-Book tomorrow and doing my First week’s worth of Grocery shopping on Thursday. If you wanna throw a prayer my way, I won’t turn it down! I made this tonight – absolutely delicious!!! If you like salmon, you will LOVE this!! Even Josiah, who only eats white fish loved it! Pingback: Whole30 – DAY 20!!! « Her Steps, Her Journey, His Grace.